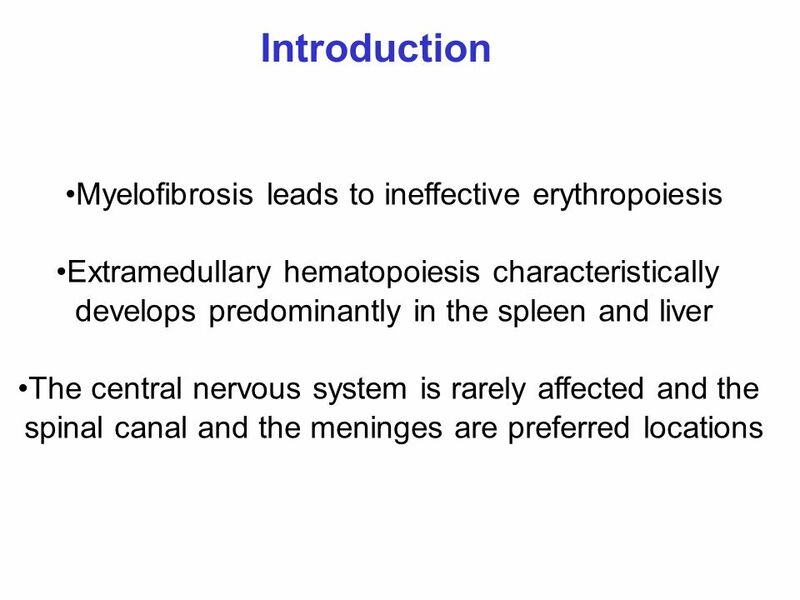 documented bone marrow fibrosis. MR imaging revealed a bilateral, frontal-solid-lesion, attached to the dura, that was hyperintense to contrast. The patient underwent a frontal craniotomy for suspected meningioma and the lesion was removed with its dural implant. Grossly the tumor resection measured in aggregate cm 4,5x3,5x3. 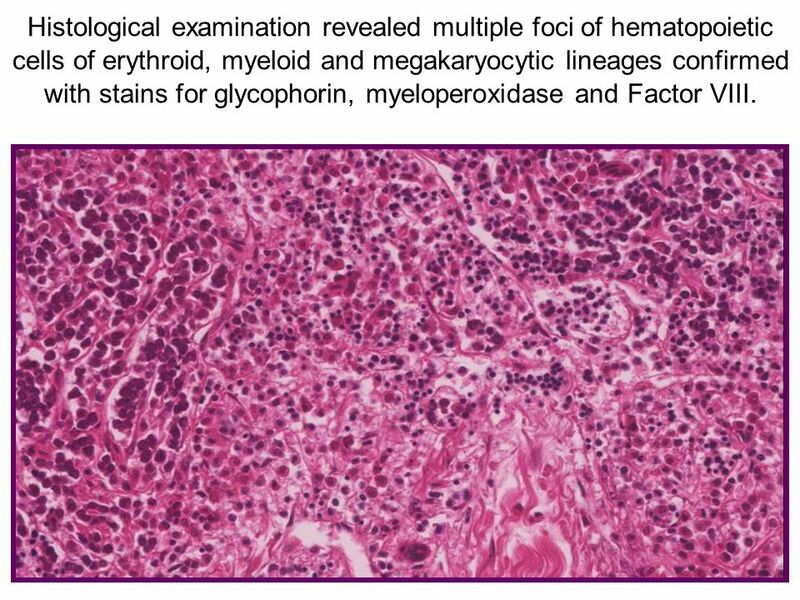 cells of erythroid, myeloid and megakaryocytic lineages confirmed with stains for glycophorin, myeloperoxidase and Factor VIII. 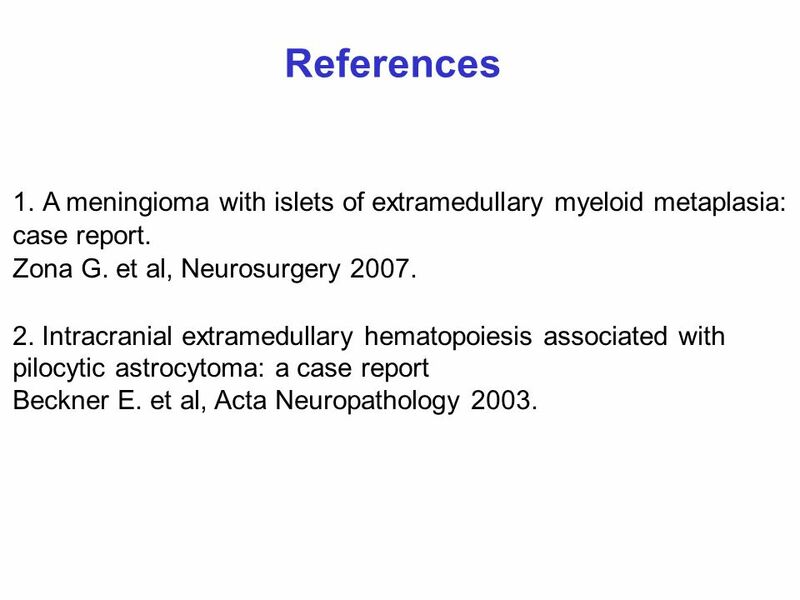 8 References A meningioma with islets of extramedullary myeloid metaplasia: case report. Zona G. et al, Neurosurgery 2007. 2. 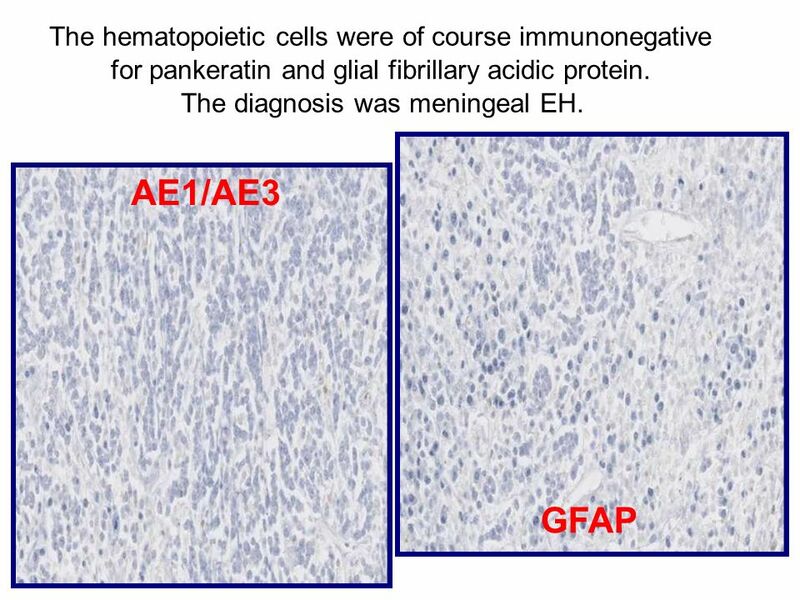 Intracranial extramedullary hematopoiesis associated with pilocytic astrocytoma: a case report Beckner E. et al, Acta Neuropathology 2003. 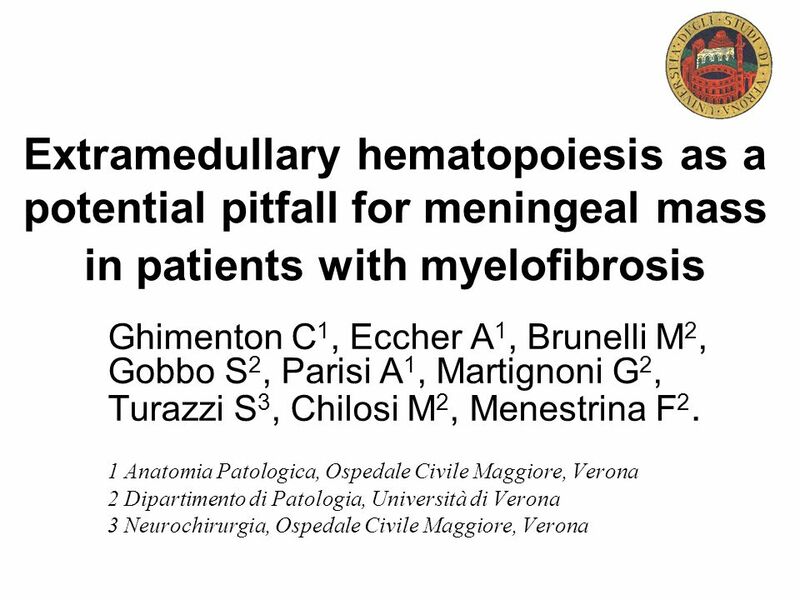 Download ppt "Extramedullary hematopoiesis as a potential pitfall for meningeal mass in patients with myelofibrosis Ghimenton C1, Eccher A1, Brunelli M2, Gobbo S2,"
Case Study 52 Edward D. Plowey. 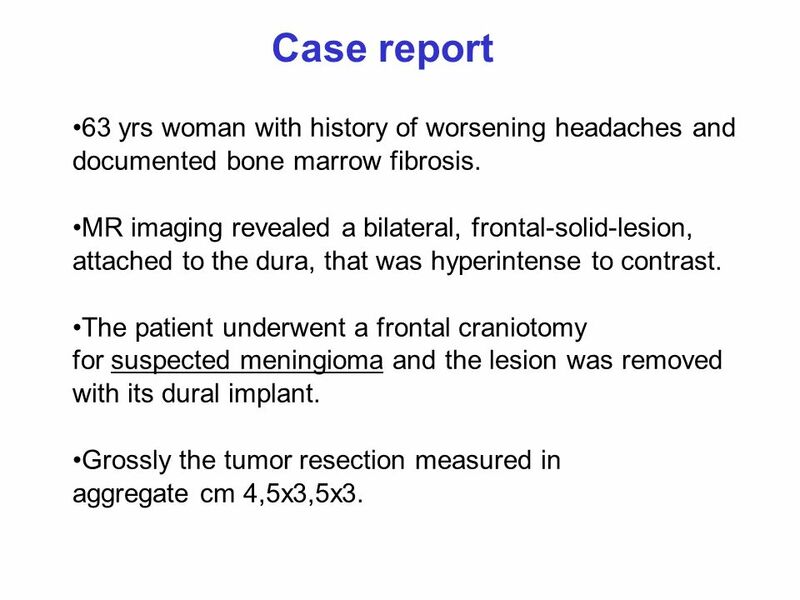 Case History The patient is a 48 year old woman with a 3-year history of migraine headaches and recent development of. Ray Peeples, MD. 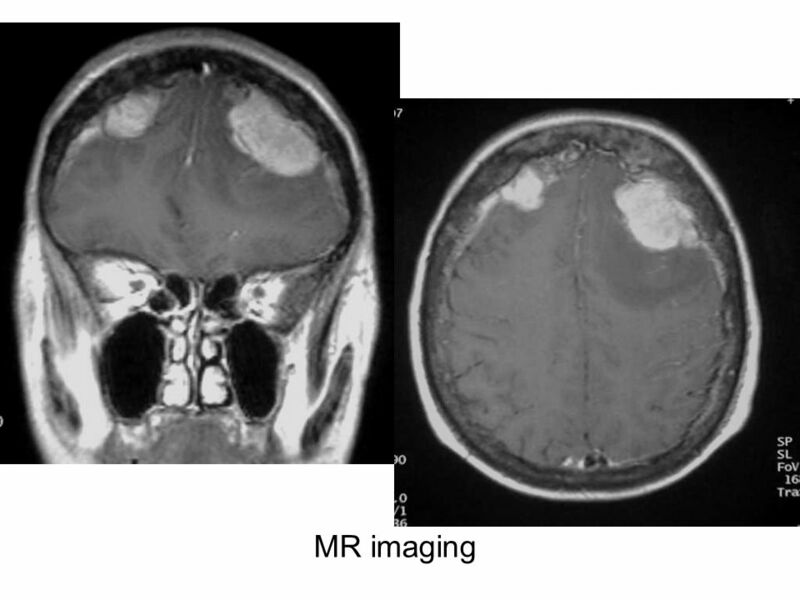 Case 1  50 y/o F with NF1  hx of meningioma debulking (2/10) and cervical neurofibroma removal (7/09)  MRI studies showed an enhancing. Case Study 13 Gabrielle Yeaney, M.D.. 40-year-old female with headache and word-finding problems, no other past medical history. Describe the MRI findings. 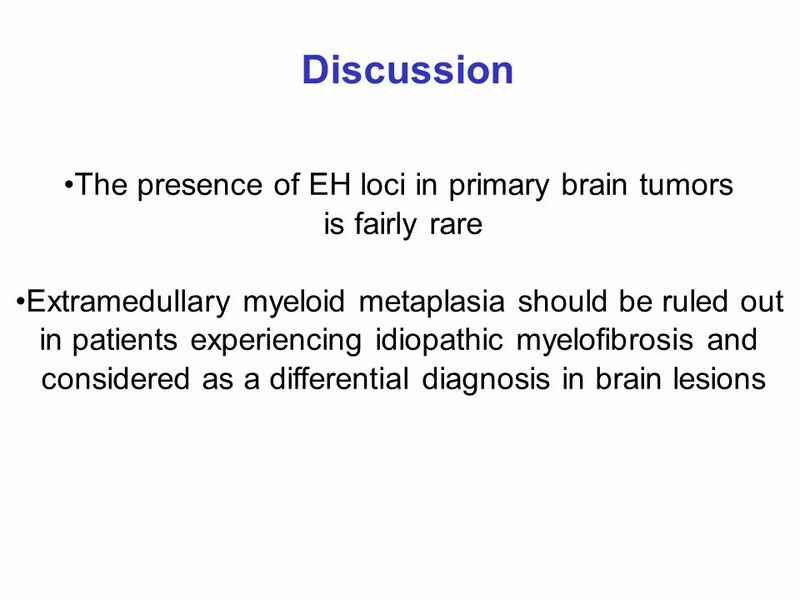 Brain Neoplasm. Benign –May have aggressive tendencies –May transition to more aggressive lesion –Tends to be slower growing Primary malignant –Age distribution. Changes in mitochondrial shape and distribution in gastric carcinoma: A morphologic, Immunohistochemical and ultrastructural study. Caruso RA, Napoli P.
Case Study 54 Edward D. Plowey. Case Study 9 Craig Horbinski, M.D., Ph.D.. The patient is a 26 year-old female. MRI with contrast was done. What do you see? Question 1. MedPix Medical Image Database COW - Case of the Week Case Contributor: Julie A Krumreich Affiliation: Naval Medical Center Portsmouth. Case Study 61 Kenneth Clark, MD. Question 1 This is a 31-year-old asymptomatic man who was found to have papilledema on a routine ophthalmologic examination. 50-year-old male admitted to the hospital for left hemiparesis. Lananh Nguyen, M.D. Division of Neuropathology University of Pittsburgh Medical Center. CNS Tumor. Intracranial tumors can be classified in different ways: 1. primary versus secondary, 2. pediatric versus adult, 3. cell of origin, 4. location. H Nèji, H Abid, A Mâalej, S Haddar, R Akrout*, M Ezzeddine*, S Baklouti*, Z Mnif**, J Mnif Imaging department Habib Bourguiba Hospital, *Rheumatology department. Central nervous system block Neuropathology practical.